With firm commitment to quality, we are engaged in offering impeccable Mobile Toilet. 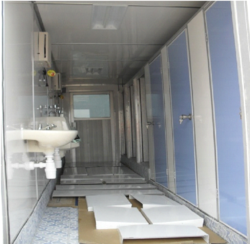 Under this range, we offer Portable Toilet Cabin, Ready made Toilet and Prefab Toilet. The toilets we are offering are manufactured by using required basic material and latest machinery, procured from the authentic vendors of the market. In addition to this, we follow the established quality parameters of the industry while designing these toilets. These offered toilets are furnished with base, commode, roof, wall panel and door. SRG international are enlisted as one of the most reputed organization engaged in manufacturing, providing and supplying wide range of Bio Toilets or Chemical Toilets. All bio toilets offered by SRG are precisely designed by our experienced professionals who are well aware of the latest techniques of designing. These products offer continuous biological process with complete eradication of pathogens. Understanding the importance of time and money of our clients, we offer our products on time and at very low cost as well. Bio toilet or chemical toilet is the most important product to save and protect our environment and surrounding. This toilet does not require any regular maintains and it is most simple and easy to use product. A SRG Bio Toilets is used to treat black water (human waste) on site, eliminating pathogens and malignant bacteria, so the treated water can be used for irrigation. Bio toilet is a revolutionary product and it sever both mankind and our most prestigious environment. These Bio toilet are Portable and movable as well which make these toilet more user friendly. 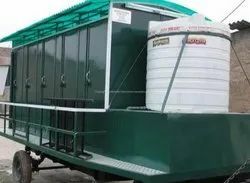 These bio toilet can be use where there is no water and sewages. SRG bio toilet digests organic human solids waste in an ecological way. SRG International Leading Manufacturer, Supplier, Exporter, Distributor, Trader of Industrial Mobile Toilet that are made from superior quality Raw material and using the technologically advanced machinery. Leveraging by the vast experience of this domain, we present clients with the premium quality of Portable Toilets. Leveraging on the qualification of SRG International professionals, we are engaged in offering Portable Toilet And Mobile Toilet, Prefab Toilet, Prefab Structcure. these Portable lift able toilet is use where soak pit is already placed and you have to stay for long period time. Portable toilet is available in 8 seats goes to 15 seats. We SRG prefab supply portable toilet in large and small quantity. 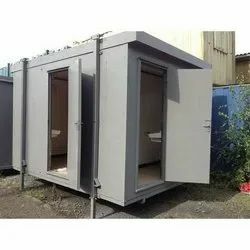 Portable rest room is requirement of every site contractor or construction engineer. 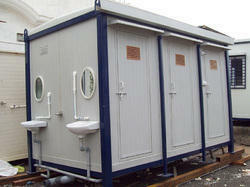 Portable mobile toilet manufacture can understand the requirement at site. We are offering FRP Portable Toilet to our clients. 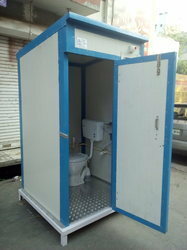 We are offering high quality FRP Mobile Toilet to our clients. 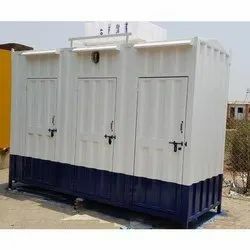 As per the needs and requirements of our clients, we are involved in providing Mild Steel Portable Toilet.